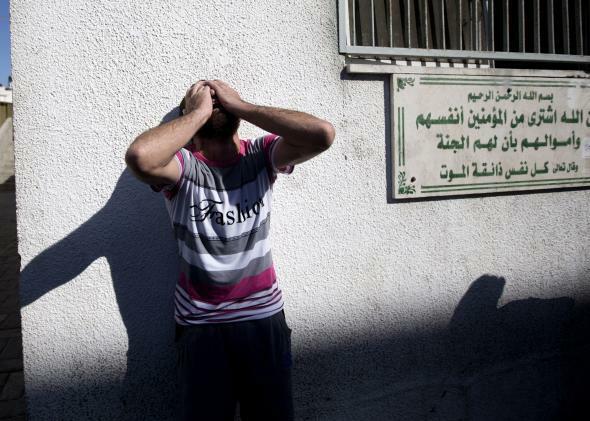 A relative of the four boys mourns outside the morgue of al-Shifa hospital in Gaza City, on July 16, 2014. An internal investigation has concluded that the Israeli military’s actions “accorded with Israeli domestic law and international law requirements” in the July 16, 2014 airstrike that killed four Palestinian children on a beach, an event that came to symbolize the brutality of last summer’s war in Gaza. While it turned out that “the identification of the figures as militants from Hamas’s Naval Forces, was in error,” the investigation concluded that “the professional discretion exercised by all the commanders involved in the incident had not been unreasonable under the circumstances” and the investigation will now be closed without any further criminal or disciplinary action taken against those involved. Lerner’s statement aligns with what Israeli officials have been saying all along: The IDF has maintained since the event happened that the deaths of the four boys were the unintended “tragic outcome” of an airstrike on Hamas targets in the area. The Israeli military has consistently denied accusations that it deliberately targeted civilian areas during the war, saying that it takes precautions to minimize civilian casualties but that they are inevitable given Hamas’s practice of hiding in civilian areas. The IDF’s investigation won’t close the book on the incident, or the topic of civilian casualties. Later this month, the U.N. Human Rights Council is due to release a report on alleged war crimes during the Gaza war that resulted in the deaths of more that 2,100 Palestinians. Supporters of Israel’s actions are already preemptively pushing back against the report, and the timing of the IDF’s statement may have something to do with that. Though the commission insists it is looking at abuses on both sides, Israel believes it will focus unfairly on them and has refused to participate in the investigation. The IDF’s statement also comes a few days after U.N. Secretary General Ban Ki-moon decided not to include Israel or Hamas on a blacklist of states and organizations that egregiously harm children in conflict. (The Gaza war was a particularly deadly one for kids.) Ban’s decision went against the recommendation of his special envoy on the issue and reportedly came after heavy lobbying from U.S. Ambassador Samantha Power. So much for the White House reconsidering its support for Israel at the U.N.